Since the Southwest Times Record article, we have been blessed beyond expectation in new fig friends and their trees. Today begins a new chapter of Figs Fort Smith. We're going to plant a fig orchard! So, John at the Squash Blossom Store in Dora has this huge Hardy Chicago Fig tree we wrote about previously and agreed to let us have all the limbs. 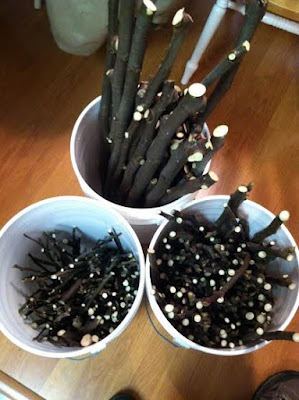 We agreed to return a portion of them back to him as rooted cuttings to do with as he will. Hardy Chicago is a beautiful, cold hardy fig variety and delicious. 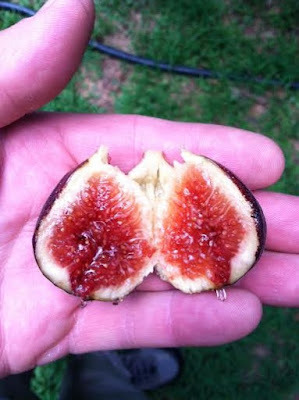 It's listed among those figs in the "Berry" category and is a favorite of ours and many other fig enthusiasts. 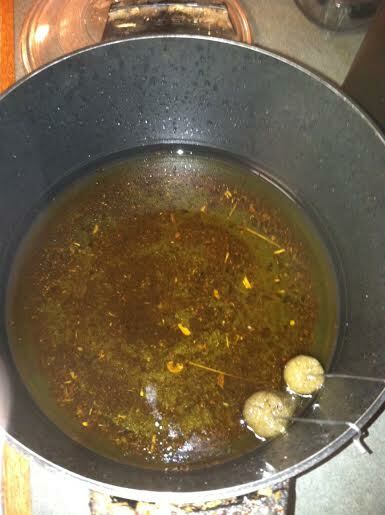 See how it's just dripping full with fig nectar! The tree during early Fall, 2015. 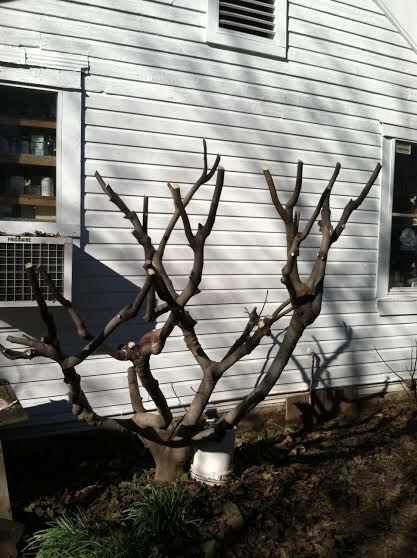 After pruning. We pruned every limb from two nodes above the previous main limbs. 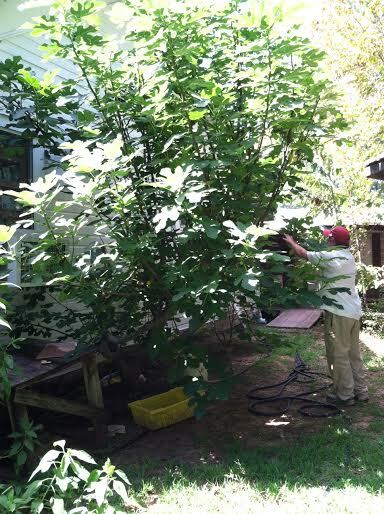 The five gallon pail gives good size reference to the tree's trunk. It is situated on the East side of this home so is shaded after noon and has still done fairly well. Figs usually do best when given full sun. 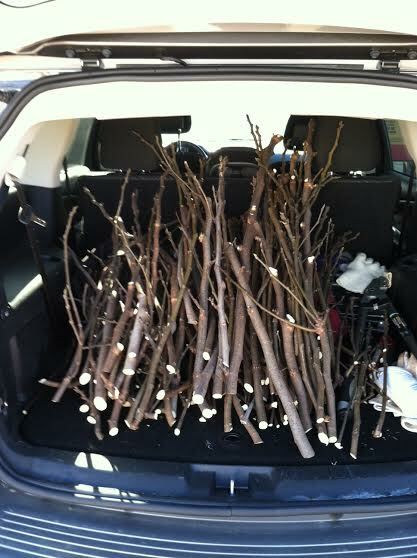 One hour's worth of pruning, limbs loaded in car and headed home for the real fun of cleaning, cutting and wax sealing the ends and side cuts. We use a fry daddy, loaded with food grade cheese wax and temperature set at 225 - 250 F. All the ends are dipped and side cuts are daubed with the handy wax dauber that hangs on the edge of the pot. Wax and wax daubers are commonly used to seal mushroom log ends and we got both at Field & Forest Products. Five hours later, we have three, 5 gallon pails of cuttings, sealed and sorted by sizes, small, medium and large. 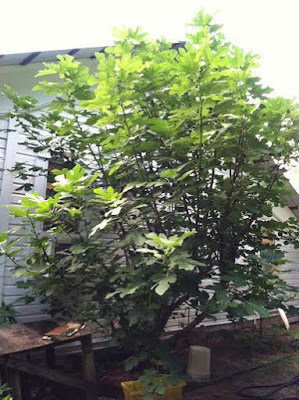 Our personal "best growing" figs this past year were Unknown Lake Spur that cuttings were buried horizontally under a few inches of wood chips/leaf compost last Winter and sprouted in Spring. We left them to nature and they showed us what nature can do, other than helping them along with a generous piling on of composted rabbit and sheep manure.